Finished in a stylish stainless steel, the Osborne eCold 220ES Undercounter Hinged Solid Door Bottle Cooler is designed to easily fit undercounter. 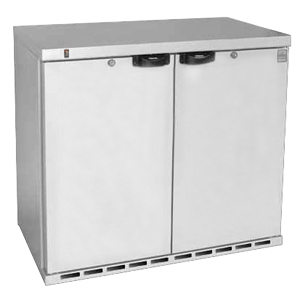 Saving vital space in your bar or pub, this bottle fridge boasts an impressive 188ltr capacity. With space for up to 200 beer bottles, you can meet the demands of busy commercial restaurants or bars. A premium quality finish ensures these bottle chillers are perfect for professional environments. Featuring a rust resistant zinc-coated steel and aluminium interior for a long lasting service. The solid doors provide endurance and a minimalist presentation. With an ozone friendly polystyrene insulation and fan assisted cooling, this bottle cooler fridge is designed to be maintenance free and highly efficient.